Make Dotty’s Teahouse even better and win a tea for four! Witness the Matico hips, Zumba at its best! Learn to dance with the stars! Get fit in the park and baby comes too! Get fabuliciously fit with zumba! I'd never go back to the 9 - 5! Fun, affordable performing arts classes with Presto! From homework to knitting clubs, our libraries have it all! Puddle Ducks is perfect for mummies and their little chicks! University student tutoring - what are the benefits? Pop star for the day - a great way to party! "When I take a photo I believe I'm creating a piece of art"
Should we buy organic food? The Supersonic - is it worth it? My son is anorexic. He's nine. How could this happen to our Super Sue? 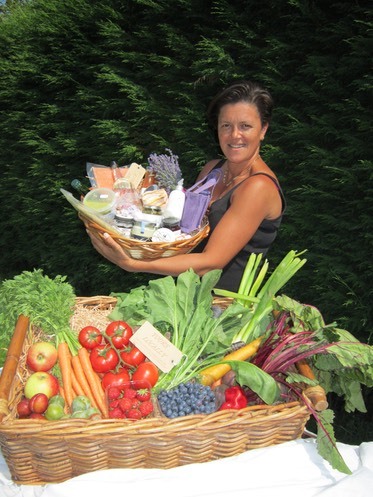 Local Mum Cherie set up her company Yours Locally to source fresh, local food and deliver it door to door. Healthy, affordable and local - no need to use a supermarket now! Local Mum Cherie got the idea for her company Yours Locally, a food delivery service that sources locally-grown produce, while watching an episode of Masterchef in February this year. "The episode was all about locally-grown food and I wondered what was available in my area," says Cherie, who launched�Yours Locally�in June. Cherie soon found out that a beekeeper lived a few hundred yards away selling local honey and a dairy producer - "Caroline and her Cows" - was making the most delicious ice cream she had ever tasted - "from cow to freezer in under an hour!" “I looked for bread, meat and vegetables from the local area,"�explains Cherie, "But it took so long. Although I could find everything I needed there was no single service out there. I wanted something which would allow me to buy everything I needed for the family from local producers and then have this delivered to my door." Deciding she couldn't be the only busy mum out there looking for healthy, affordable local food, Cherie created a unique service which brings together local farmers, food producers and suppliers. Cherie now does all this through her website www.yours-locally.co.uk which went live in the Summer. Cherie found that there were a vast number of local producers working extremely hard right on her doorstep, producing amazing, good quality, fresh produce yet she had no idea they were there. "I was literally driving straight past them to go to the supermarket each week!" says Cherie, who has found a natural mineral water supplier; various locally grown fruit and veg stockists; artisan bread makers; award winning curry sauces; fresh locally-reared free range eggs; Farm Assured beef, lamb, pork and poultry; lavender products; beeswax and honey products...the list is endless, all from within a close proximity of her home. Yours Locally�sources from just 40 miles from Kingswood which enables Cherie to also supply fresh fish, caught daily on the South Coast. This range, added to the over 600 products already listed on the website means Yours Locally can deliver "everything you need and it’s sourced locally." Thanks to Cherie, local families can now enjoy fresh, healthy food from local suppliers and not have to worry about their carbon footprint. "I can guarantee the produce is fresh, healthy and benefits our local economy,” says Cherie. Cherie wondered why she did not know about or support local producers and why, like everyone else, she would travel to large supermarkets week in, week out to purchase food that had travelled thousands of miles before it hits the shelves. "The produce from these local producers is not only extremely high quality, but healthier by the fact it hasn’t travelled around the world," adds Cherie. "Any mum - every mum - wants the very best for their child, yet we are giving them over-processed foods, full of preservatives and additives." "We have a page on our website which gives some interesting facts about where our foods generally travels from," explains Cherie. "It’s really quite incredible when we have the exact equivalent available locally." Yours Locally started off as a entrepreneurial idea but it’s becoming more like a mission for Cherie now. "Yes it’s a business, but it’s something I am extremely passionate about and the more I research, the more driven I am to get this message out there."